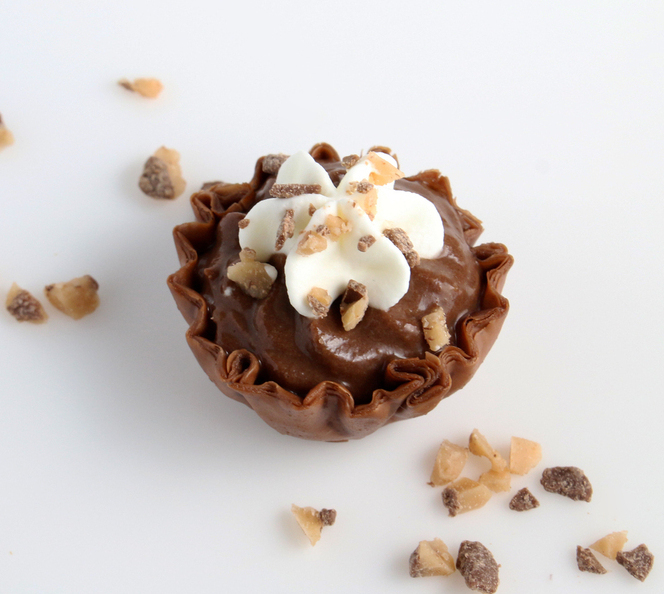 These mini pies pack intense chocolate flavor, creamy sweetness and a crunch that’s impossible to resist! In a medium sauce pan, whisk together sugar and milk. Simmer mixture, whisking frequently. In a small bowl, whisk egg yolks and cornstarch together. Temper the eggs by slowly whisking in 1 tablespoon of heated milk mixture and then repeat with 3 more tablespoons of milk mixture (1 at a time). Slowly whisk egg mixture into heated milk. Whisk constantly until it starts to thicken and comes to a very gentle boil. Remove pan from heat and whisk in butter, salt, chocolate and vanilla extract until smooth. Cover filling with plastic wrap and chill for 2 hours. While filling is chilling, make whip cream. In a small chilled bowl, combine heavy cream, confectioners sugar and crème de cacao. Using an electric mixer, beat until stiff peaks form. 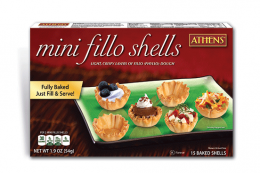 Pipe or spoon chocolate filling into phyllo shells. Top with whipped cream, toffee bits and serve. May also be stored in freezer and served as an ice cold treat. 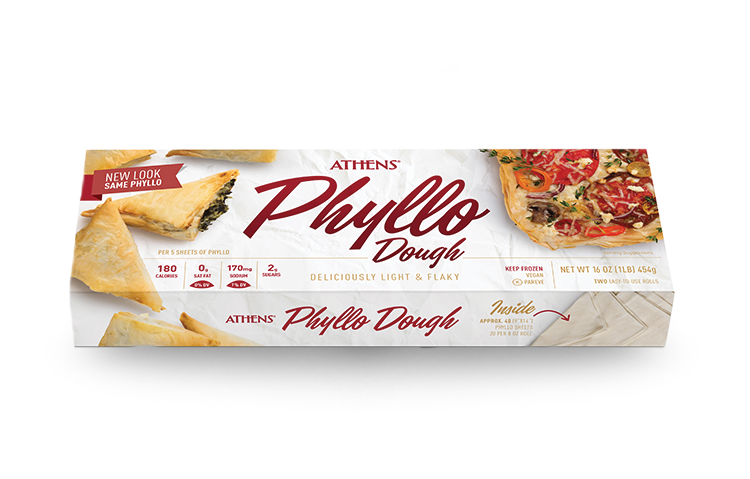 These meat-free, flaky phyllo rolls featuring red and yellow onions, sweet peppers, scallions and fennel make for a great anytime treat.